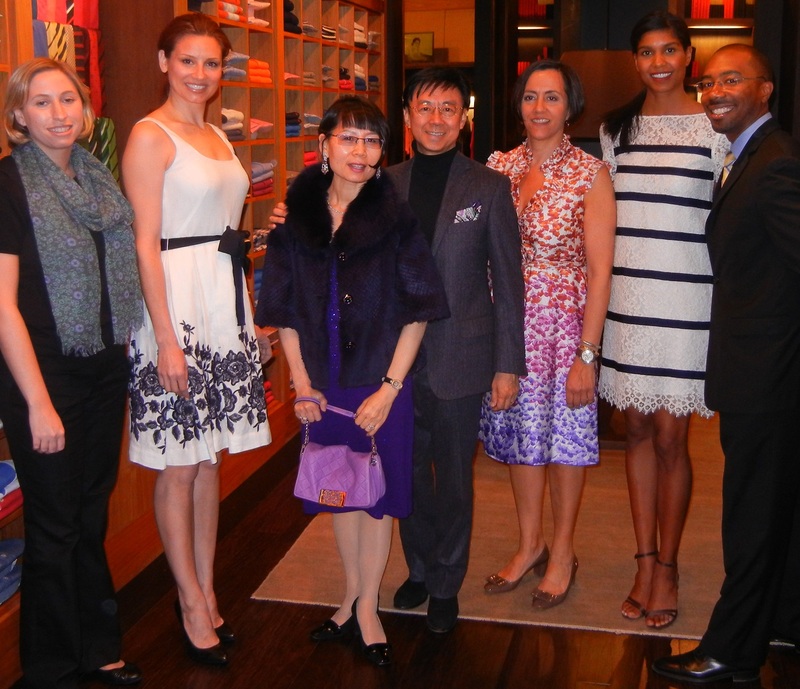 Daphne & Charles Chan from Harvest International (a commercial real estate company), co-hosted a special event yesterday night at the Carolina Herrera boutique located in the Americana Manhasset, a luxurious shopping destination. The successful and charitable turn-out included a night filled with vibrant colors from Herrera’s Spring/Summer 2013 collection, cocktails & tea, and hot hors d’oeuvres. It was a night that aimed to benefit the victims of the Szechuan, China earthquake. Part of the sales proceeds will be directed towards the earthquake relief through the Tzu Chi Foundation, a global charity organization. Attendees include JP Morgan Chase Bank, World Journal News, Central Flushing Lions Club International, and various prominent real estate developers. Those who were unable to attend the event generously donated as well, to name a few: London Jewelers of Long Island and DeLuca Financial Planning. “It’s a great event for a great cause,” said Claire Hsu, an excited attendee. With a bite of chocolate covered strawberries, a sip of champagne, and the shuffling of the signature red Herrera gift bags, guests left the event. The event might have ended but the warm-hearted charitable spirits from all parties will continue to uplift the global communities. Daphne Chan dressed in purple with Charles Chan and to the right is Vicky Karyannis, the store manager. Q: How did this event come about? A: “It first started as a request from Ms. Vicky Karyannis and Ms. Lillian Millan, the manager and assistant manager of the Carolina Herrera boutique in the fabled Americana Mall in Manhasset because my wife, Daphne, and I have frequently shopped at this store. They wanted to drum up more awareness of the brand to the public particularly to the Asian communities and so we thought it would be a great idea to host an event that direct part of the sales proceeds to benefit a charitable cause of my choosing. I chose the Tzu Chi Foundation due to the recent earthquake that happened in Szechuan, China. Historically, this organization sets no boundaries (ethnically and geographically), and they often send in their own medical aid with doctors with volunteers to do good deeds and try help to relief suffering of the devastated victims and families. Tzu Chi Foundation’s mission consists of four major components: Charity, Medicine, Education, and Humanity and those are missions that my wife and I could not have agreed more on. Visiting their website will tell you so much more in detail about what they’re passionate about and about what they do.” I also favor other charitable organizations as well but in this earthquake incident I feel that they will best serve our intent and purpose. Q: Is there a certain amount that you hope to achieve in donations? Q: How would you describe Carolina Herrera’s past and current designs along with products? A: Carolina Herrera is a multi-talented lady, she has continuously evolved, grown, and developed into a very much admired world-class power fashion house; she is highly in-tune with leading the fashion trends with a very unique sense of style. She provides ready-wear for women and men, leather goods and accessories, as well as a home line. Her clothes exude elegance and sophistication with simple silhouettes, with fun and playful colors but with a distinctive style. She is extremely gifted with her use of colors and patterns, and she really should deserve more recognition in my opinion! Q: What are your thoughts on their Spring/Summer 2013 Collection? For Pictures of the event please visit our Facebook Page. Mr. Chan went to Honolulu Hawaii in his early teens as a full-scholarship student from Hong Kong to pursue college studies in Hotel & Hospitality Management. After he received his diploma and worked up as the Front Desk Assistant Manager position at the Ambassador Hotel in a short time, he enrolled to the University of Hawaii to better himself in the field of Accounting and Business Management. Shortly afterwards, Mr. Chan was recruited by Delta Airlines (then Western Airlines). Based in San Francisco he started his airlines career in reservation and sale while pursuing higher education. He finished his undergraduate works in Human Relations and Behavioral Science in U.S.F. (University of San Francisco) while working for the airlines and further received his Master of Business Administration in International Business Management with emphasis in Real Estate Investment from Golden Gate University of San Francisco. Powered by his dream to succeed and ambition in the business world, he moved to New York after receiving his MBA. After he resigned from his airlines supervisor career, he began his journey in the real estate brokerage industry in 1986 and became the top producer of the then Merrill Lynch Realty (which later merged with Prudential Realty) and was recruited by Sutton & Edwards, a commercial real estate firm based in Long Island, and received his training in the commercial real estate field. After working for a year in the firm he followed his instinct and left to form his own retail leasing company, known as Harvest International. Harvest International, established since 1992, models after major houses of the American mainstream commercial real estate firms. Mr. Chan specializes in Restaurant and fashion tenants rep works and had performed project financing by bringing Swissotel, a subsidiary of Swiss Air, to Paris and matched it up with the prominent S.A.R.I. Grouppe of France to joint-venture for a hotel development in La Defense, Paris. In recent years, Mr. Chan has spearheaded the business growth and expansion trend by leading Asian tenants into mainstream shopping malls. For example, malls owned by General Growth (then The Rouse Company) in America on a national scale to operate and expand. Mr. Chan was also instrumental in helping customers to successfully complete several triple net lease projects of over 100,000/sf in each case on buildings that are under utilized, turned them around and has earned himself a name of as a well-respected and prominent commercial real estate broker in the Asian American businessmen society, particularly in New York. Harvest International is now an established, successful commercial real estate company and recently launched a retail and restaurant concept development consulting service so more clients can fuel their growth and expansion by bridging West to East and East to West. Hotel Management, Cannon’s College of Honolulu, Diploma Accounting, University of Hawaii (LCC), A.S. Degree Business Management, University of Hawaii, A.S. Degree in Human Relations and Behavioral Science, University of San Francisco, B.S. Degree in International Business Management, and Golden Gate University of San Francisco, M.B.A. Degree. Bi-lingual in Chinese and English, some conversational Japanese and French. Awarded the exclusive agency rights to market a high-end mix-use 250,000/sf project in downtown Flushing by planning the appropriate tenancy mix as well as pre-lease and sale.